Many of our favorite recipes in Cee Dub’s cook books and the Powerless Cooking (R) data base trace their origins to leftovers. IN A PIG’S EYE is no exception and became an instant hit. It all started one Sunday morning while rummaging through the refrigerator looking for something to make what I call “a change of pace recipe.” In other words, using whatever ingredients I have on hand, can I whip something up that is worth writing down and fixing again. 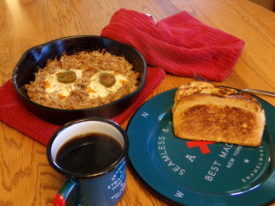 Now, when we make pulled pork we always set enough aside for a breakfast of IN A PIG’S EYE. Directions : In a cast iron skillet melt a couple of tablespoons of butter or bacon drippings. Stir fry pulled pork over medium heat for 4-5 minutes until heated through. Spread the pork over the bottom of the pan and reduce the heat a bit. With a spoon make two small divots in the pulled pork. Break an egg into each divot, salt and pepper, and cover for 3-4 minutes until the eggs are done to your liking. In another cast iron skillet, pan toast the two buttered tailgates. Garnish eggs with hot sauce if desired. Serve with a jalapeno slice on each egg yolk.